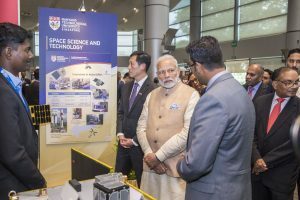 INSPIRE started off in 2015 as an international consortium of space-­faring universities coming together for space science missions while developing academic programs to teach space science and engineering. Centered on campuses around the globe and powered by distance collaboration and education, INSPIRE joins students, instructors, universities, industry, and space agencies in an endeavor to educate new engineers and scientists, build and launch new space missions, and drive leading-­edge scientific discovery and technology. Seed funding from CU Boulder helped initiate this program. The University of Colorado Boulder (CU), USA. INSPIRE aims to provide a constellation of Earth & space weather observing satellites and develop a university microsatellite platform to address some of the outstanding questions in quantifying climate change, atmospheric coupling processes, and space weather effects. INSPIRE offers participating universities and industry partners the opportunity for cutting-edge research in the earth sciences and developing spacecraft technologies.